Although it’s easier than ever to stream 60fps videos on YouTube, this potential is hindered by the fact that you can only view clips in this frame rate with the right computer configuration and fast Internet speed. Without these two factors, you may experience lags and buffering on your YouTube videos. Therefore, it would be a good idea to download these 60fps videos on your PC or Mac, so that you can watch these videos any time any where. If you have no idea of how to download 60fps videos from YouTube and still looking for the best way, then you have come to the right place. In this section, we have handpicked top 5 software that can make downloading 60fps YouTube videos easy as pie for Windows and MacBook users. Now let’s talk them one by one in detail. When you are playing a game, especially FPS game, you will find that 60fps looks smooth, while 30fps looks bad. But if you are watching a movie, even 24fps will be okay. So if a video is made on the topic of gaming strategy, then the frame rate will be possibly 60. If you want to save a 60fps game video from YouTube, how to do that? Well, with the help of Gihosoft TubeGet， this will no longer be a problem. 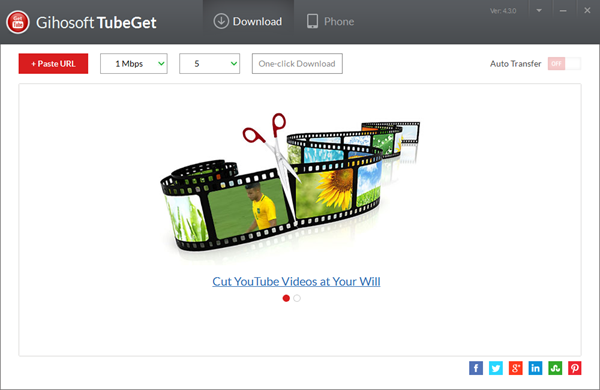 The Gihosoft TubeGet is a desktop downloader that specializes in getting videos with high resolution and lossless output. What is amazing about Gihosoft TubeGet is the fact that it can easily retrieve the audio and video tracks as a whole of 4K & 8K YouTube videos even if the website stores them separately. Apart from YouTube, Gihosoft can also facilitate the download of clips from other streaming and social media platforms like IGTV, Twitter, Vimeo, Facebook, Tumblr and a hundred more websites. It also gives you the option to convert these videos into audio clips as MP3 files. Gihosoft TubeGet has three plans. Both the $29.95 Personal Edition and $75 Family Edition have free lifetime technical support and update. The Family Edition has license for up to 5 PCs or Macs. Do you know about 60fps video quality yet? Have you ever watched 60fps videos on YouTube? If so, then you must know that the 60fps videos look great compared to 24fps & 30fps videos. It will be a great idea to save these high frame rate videos on your computer for playback, and 4K Video Downloader is another YouTube video downloader software that has the ability to save YouTube 48fps & 60fps videos. 4K Video Downloader delivers on the promises of its name by bringing high-quality videos from many popular online video sites including YouTube, Vevo & SoundCloud etc.. It has a stunning look as well, with a minimalist design that will not confuse even non-techie users. It can even keep subtitles in the downloaded file, including both built-in subtitles & auto-generated ones. 4K Video Downloader may be a free app but that does not mean it compromises on the quality of the downloaded videos. It allows users to download YouTube 1080P, 4K & 8K videos in 60fps if the resolution & frame rate is available. Apart from that, 360°& VR videos are also supported by the software. You no longer have to worry about lags when playing these videos as they are already saved locally on your device. As the largest video-sharing site, YouTube is always at the forefront of the video technology field, and now it supports the upload & watch of 4K, 8K, 60fps, 360 degree, 3D & VR videos etc.. As today’s topic is about downloading 60fps videos, let’s cut the crap and directly jump to it. Softorino is another favorite YouTube video downloader for 60fps among many users. This app provides users the choice to download any clip from YouTube at the highest frame rate possible. For example, if 60fps is available for the video you want to download, it will automatically save it in that frame rate. The great thing about Softorino is the fact that the software itself is not too heavy. Plus, it also supports other streaming websites apart from YouTube. The usage of this software is super easy: you just head to YouTube and copy the link of the desired video to the clipboard, it will automatically capture the link and add it to the downloading list. Then you just pick the quality rate and choose where you want to save it. Click on the big bright “Download” button – and the video will be saved on your computer in a few minutes. WinX HD Video Converter Deluxe is an all-in-one software package that enables users to save multiple HD & high frame rate videos from YouTube on their own PC or Mac. It’s equipped with multi-core CPU support and QSV and CUDA/NVENC hardware acceleration tech, which means that the download and conversion process would be finished in a faster way than the competitors, definitely will save you a lot of time. Winx has a lot of users because it has an intuitive layout which is easy to navigate. Besides, this downloader can also download video at any of the resolutions available, such as 720P, 2K, 4K & 8K, and support batch downloads at the same time. The downside of Winx is that you have to update the dynamic analyzer on a consistent basis, which will consume you extra time every time. And the downloader misses out on some of the more advanced features such as multi-stream downloads. The WinX HD Video Converter Deluxe has versions for both PC and Mac. It gives options for users with regards to the quality of the video that will be downloaded. You can also choose the format and device profile of the video that will be retrieved from YouTube. Video streaming websites and platforms like YouTube have been speedy in their development of technology that makes clips more immersive and realistic. However, Internet service providers and hardware manufacturers don’t have much success in keeping pace with YouTube, so that netizens will face lagging and other other playback issues while watching YouTube videos online. To enable users to still enjoy 60fps videos, they need to download these videos on their own devices offline. When it comes to frame rate, 60fps is definitely better than 30, if all other things are equal – image quality, no buffering etc. Although they are hundreds of 60fps video on YouTube, the bad news is that you can not retrieve them from YouTube directly. Well, will you just give up on that? Definitely not. With the right software in hand, one can save these 60fps video from YouTube without any hassle, and WonderFox HD Video Converter is one of them. Through an exclusive video encoding technology, WonderFox HD Video Converter Factory Pro brings YouTube videos to users for offline viewing. If you are in a hurry, WonderFox is especially good for you as it finishes the conversion and download process in a fast way. The moment that you add the URL to the software, you will be given the available resolutions, formats, sizes that the original video has. Then, just one click, you can get the answer of how to download 60fps video from YouTube. These are the 5 best YouTube video downloader for 60fps that work smoothly on your PC & Mac. Do you have other ways to download YouTube 60fps videos? Feel free to leave your tips, recommendations, and opinions in the comments section below.